A pact between two of the world’s largest iron ore producers promises to intensify competition among the sector’s top four players, just as Chinese demand is forecast to falter after the nation’s production of steel peaked. The agreement between Brazil’s Vale SA, the biggest supplier, and Fortescue Metals Group Ltd., the No. 4 exporter, includes plans to develop joint ventures to create about 80 million to 100 million metric tons a year of a blended product that would compete more closely for customers with output from BHP Billiton Ltd. and Rio Tinto Group. It’ll allow a Vale-Fortescue partnership to meld the Brazilian firm’s higher grade product with Fortescue’s lower grade iron ore to meet the benchmark standard most in demand in China. Vale said in December it forecasts iron ore production in 2016 of 340 million to 350 million tons, while Fortescue expects to hold exports at an annual rate of about 165 million tons. As prices plunged about 67 percent since a 2011 peak, the big four producers have focused on raising low-cost exports to China from Australia and Brazil, squeezing smaller, more expensive competitors from Sweden to Iran out of the seaborne market. The quartet will account for about 77 percent of global supply this year, so the deal may risk antitrust intervention from China, according to Jefferies LLC. Fortescue has held some initial talks with regulators and doesn’t foresee complications on competition grounds, Chief Executive Officer Nev Power told reporters Tuesday on a conference call. The pact isn’t seen as a prelude to any takeover of Fortescue by Vale, he said. Under the accord, Vale would take a stake in Fortescue of between 5 percent and 15 percent. No time frame has been set for the acquisition and the purchase would be at Vale’s discretion, Power told Bloomberg Television Tuesday in an interview. The two companies may also cooperate on future development of new mines, he said. BHP doesn’t see the deal as “something we would expect to impact us directly,” the producer’s President of Operations, Minerals Australia, Mike Henry told reporters Tuesday on the sidelines of a conference in Perth. Rio Tinto declined to comment. The deal would probably make it more complex for BHP or Rio to target any future acquisition of Fortescue, according to Wayne Gordon, executive director for commodities and forex at UBS Wealth Management, said by phone from Singapore. 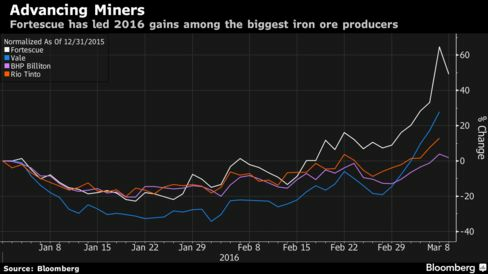 Optimism over the willingness of Chinese policy makers to bolster economic growth pushed iron ore Monday to its biggest one day gain on records dating to 2009, surging 19 percent. The announcement from two key suppliers is likely to be interpreted as another welcome signal for prices, according to Randal Jenneke, head of Australian equities at T. Rowe Price Group Inc.